Senate Minority leader, Godswill Akpabio, has said the leadership style of Kogi State Governor, Yahaya Bello, is making it difficult for the Nigerian to emerge as political leaders. Akpabio said the 42-year-old governor was creating an impression that elders should be recycled as leaders. 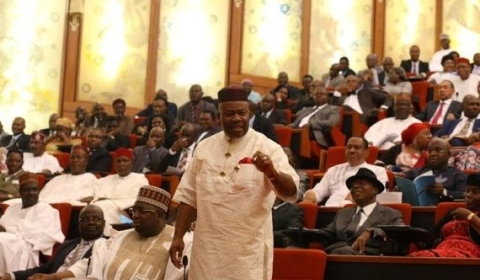 He spoke on the floor of the senate on Wednesday while contributing to a debate on a motion sponsored by Senator representing Kogi West, Dino Melaye. The former Akwa Ibom governor said it was unfortunate that Bello was creating controversies at a time when youths were trying to contribute their own quota to the development of the country. “Unfortunately, it is Kogi again. And then here we are in the senate trying to make laws to enable the youths who can vote in the election to be voted for. “I see a very youthful governor trying to give the impression that we elders should continue to recycle ourselves because the youths are not ready. I do know that the youths are ready to contribute their own quota.